When you follow your dreams, the possibilities are endless! Milla loves nothing more than imagining grand adventures in the great wide somewhere, just like Belle. She dreams of traveling the world and writing about her incredible discoveries. Unfortunately, there is nothing pretend about the fifth-grade overnight and Milla's fear that her moms won't let her go. Enter Piper, Mariana, Zahra, and Ruby. 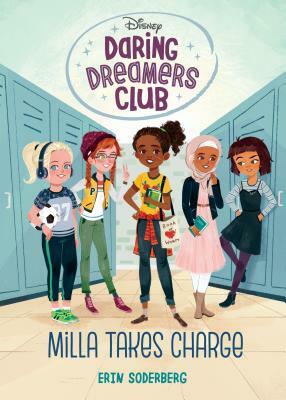 Together with Milla, they form the Daring Dreamers Club and become best friends. But can they help Milla believe she's ready for this real grand adventure? Diverse, talented, and smart--these five girls found each other because they all had one thing in common: big dreams. Touching on everyday dramas and the ups and downs of friendship, this series will enchant all readers who are princesses at heart. Erin Soderberg Downing was obsessed with Disney's The Little Mermaid as a kid. She loved Ariel's sense of adventure, and longed to explore and learn about unfamiliar places. Growing up, she dreamed of venturing into outer space, hoped someday she might live in New York City, and planned to travel the world. Though she never made it to space, Erin did live in New York City (as well as in England and Sweden), and she has explored many countries around the world. Now, she lives in Minneapolis, Minnesota, with her husband, three adventure-loving kids, and a mischievous Goldendoodle named Wally. Before becoming an author, she was a children's book editor, a cookie inventor, and also worked for Nickelodeon. She has written many books for young readers, including the Quirks and Puppy Pirates series. Anoosha Syed is a Pakistani-Canadian illustrator and character designer for animation, receiving her BFA from Ceruleum Ecole d'arts Visuels in Switzerland. She loves to create diverse characters and stories, and her favourite Disney princess is Rapunzel. Her work can be found at anooshasyed.com.